A leading Islamic scholar and the author of What Went Wrong traces the history of conflict between Islam and the West, exploring the meaning of the Islamic doctrine of jihad at various periods in history, the rise of militant Islam, and the impact of Saudi proselytizing and oil money on the rest of the Islamic world. Reprint. 75,000 first printing. "Terrorism requires only a few. Obviously the West must defend itself by whatever means will be effective. But in devising means to fight the terrorists, it would surely be useful to understand the forces that drive them." "Remarkably succinct . . . It offers a long view in the midst of so much short-termism and confusing punditry. Lewis has done us all--Muslim and non-Muslim alike--a remarkable service." "Inestimable . . . replete with the exceptional historical insight that one has come to expect from the world's foremost Islamic scholar." "No scholar of Islam in the Western world has more thoroughly earned the respect of generalists and academics alike than Bernard Lewis. . . . An excitingly knowledgeable antidote to today's natural sense of befuddlement. . . . History with electric immediacy." In his first book since What Went Wrong? Bernard Lewis examines the historical roots of the resentments that dominate the Islamic world today and that are increasingly being expressed in acts of terrorism. He looks at the theological origins of political Islam and takes us through the rise of militant Islam in Iran, Egypt, and Saudi Arabia, examining the impact of radical Wahhabi proselytizing, and Saudi oil money, on the rest of the Islamic world. 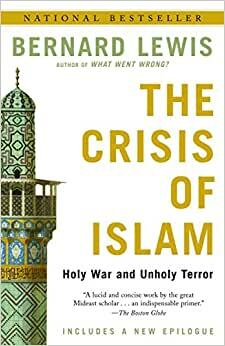 The Crisis of Islam ranges widely through thirteen centuries of history, but in particular it charts the key events of the twentieth century leading up to the violent confrontations of today: the creation of the state of Israel, the Cold War, the Iranian Revolution, the Soviet defeat in Afghanistan, the Gulf War, and the September 11th attacks on the United States. While hostility toward the West has a long and varied history in the lands of Islam, its current concentration on America is new. So too is the cult of the suicide bomber. Brilliantly disentangling the crosscurrents of Middle Eastern history from the rhetoric of its manipulators, Bernard Lewis helps us understand the reasons for the increasingly dogmatic rejection of modernity by many in the Muslim world in favor of a return to a sacred past. Based on his George Polk Awardwinning article for The New Yorker, The Crisis of Islam is essential reading for anyone who wants to know what Usama bin Ladin represents and why his murderous message resonates so widely in the Islamic world. Begins with an unapologetic explanation of the thoughts/feelings/beliefs of the faith. Mentions the first contact information of a nation far to the west with a capital by the name of Washington. Features a list of where countries rank in education, production, and others and the countries are all very low. Mentions the use of assassins. Insightful. Princeton Professor Bernard Lewis is a master historian and an authority on the Middle East, particularly Islam. His insights on the Muslim religion and terrorism alone are worth the price of the book. It is well written and relatively easy to read. Through these brief pages, Bernard Lewis traces the history of Islam and some of its important tenets. He does a fantastic job at describing America's history and involvement against terrorism and Islam's hostile view against the US. He describes the reasons why Islamic terrorists vehemently despise America and seek her destruction. Quotes from the Qu'ran, Usama Bin Laden, and key terrorist leaders make this an interesting read. Bernard's grasp of global Islam helps put into perspective why terrorism is such a dominant force in the world today. It's a clarion call to all Americans, and one that cannot be ignored. This is the number one problem across the globe today. As stated in Bernard's final sentence, "If the fundamentalists (terrorists) are correct in their calculations and succeed in their war, then a dark future awaits the world." His words were virtually prophetic. After Lewis penned those words a dozen years ago, the world is a much darker place today because of Islamic terrorists. 5.0 out of 5 starsExcellent, probably everyone who is not versed in Islam should read it to help understand current events. An excellent introduction to Islam for the neophyte who wants more than just a magazine article. The author is recognized as one of the most informed and prolific experts on the subject. Bernard Lewis is one of the most respected Middle East experts, but unlike other writers who can make that claim he is also a noted historian rather than a journalist or retired military officer. His expertise is based on a lifetime of scholarship and is beyond question. Recently, he also hit the best seller list with "What Went Wrong: Western Impact and Middle Eastern Response," a collection of essays that are best appreciated by those with some prior knowledge of Islam and the Middle East. His latest work, "The Crisis of Islam: Holy War and Unholy Terror," is also derived from previous essays and articles, but here Lewis has ably integrated earlier pieces into a single, and very readable, book. The purpose is clearly to provide a post-9/11 source on Islam and the Middle and their relationships with the West, especially the United States, that is accessable to those who are not experts in the study of these issues. Modest in length, this is still a detailed work that speaks with a unique authority. He may not map out possible strategies or policies, though he does have an in as an advisor to the Bush Administration, but he certainly tells us something about the thought processes, and the belief system of a culture that seems so alien to many Americans. In reference to the sources of terrorism that use Islam as justification he concludes that the West has every right to defend itself, but must also seek some "useful" understanding of the "forces" that "drive" these people. "The Crisis of Islam" works quite well in illustrating these "forces." Actually, Lewis is far more successful in explaining "what went wrong" in this volume than in his more celebrated, earlier work. If this work also becomes a bestseller it will be good news simply because it will mean that an increasing number of people are educating themselves about peoples, cultures, and problems that they know so little about. Bernard Lewis' 'The Crisis of Islam' is a several hour read that covers the history and theology of Islam. Most of the chapters have a moderate, center-of-the-road, analysis of where Islam stands and how they got there. Whether you agree with Lewis' afterword or not you will gain important insight into an often misunderstood Middle East. I only have two gripes with 'The Crisis of Islam': one small and one very large. A small problem with the book is that it tends to be rather selective when doing comparative economic analysis. In chapter 7 he blames poor economic performance on the Middle East's inability to embrace globalization. Then he points to the striking success of the Asian Tigers as what could have been. What he selectively forgets to mention is the 1,000 pound gorilla in the room: South America. Those very same policies didn't work in SA (or for that manner completely in Southeast Asia). To just accept the embracement of western modernity (which varies widely in definition) as economic success seemed rather hurried and naive. However, considering this is a somewhat minor point in the book I'll let it slide. The truly alarming problem with 'The Crisis of Islam' is his prescription to the problem. Lewis claims "the war against terror and the quest for freedom are inextricably linked, and neither can succeed without the other. the struggle is no longer limited to one or two countries, as some Westerners still manage to believe. It has acquired first a regional then a global dimension, with profound consequences for all of us." This is by all means a radical statement. It is a 21st century reiteration of the Domino Theory. It is a 21st century White Man's Burden. To do anything else would mean global instability. Am I the only one that thinks this is as ridiculous as the Domino Theory and the White Man's Burden? It is not the duty of the US, or any other nation for that matter, to dictate what others should believe through war. Lewis' claim that we need to take preventive action is highly misguided. Yet it is too late to prevent the blunder of Iraq. The greatest question is what should we do now. To that measure Bernard Lewis' 'The Crisis of Islam' is still pertinent. Read 20 or. 30 books on this subject. This book is the essential primer. It is the cliff notes so to speak.